UVS not only provides specialty veterinary medicine to cats and dogs in our community and throughout the tri-state area but we also believe it’s important to help our community in other ways. As individuals and in small groups, we volunteer our time and effort to ‘non-furry’ needs. October 27, 2017 – Upstate Veterinary Specialties’, Owner and Cardiologist, Aaron C. Wey, DVM, DACVIM presented at Cornell Cooperative Extension’s 4-H Vet Science Program on Wednesday, October 25. The vet science program is for young adults ages 12-17 who are interested in pursuing a veterinary degree as their career. 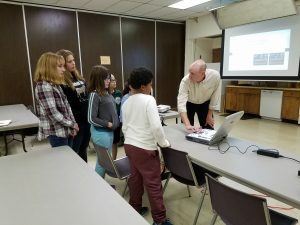 During their four week program, the kids hear presentations from various professional in the veterinary science industry to encourage learning and increase their knowledge about the profession. As a board certified specialist in cardiology, Dr. Wey spoke to the kids about his journey to becoming a veterinary specialist, as well as some of the tools used to evaluate and treat cardiac patients in a veterinary specialty hospital. May 18, 2017 – Upstate Veterinary Specialties participated in CDPHP​’s Workforce Team Challenge for the fifth year in a row! UVS joined 10,000 other runners and walkers for the 3.5-mile road race in downtown Albany. 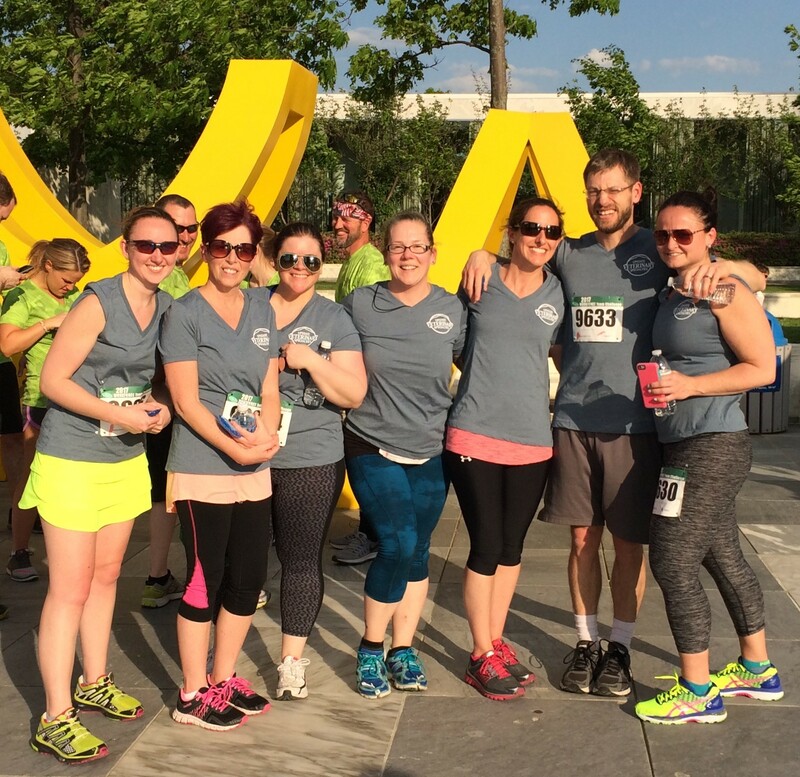 We love supporting this great event that promotes team camaraderie and health and fitness opportunities in the workplace! All race proceeds benefit the Hudson Mohawk Road Runners Club​, as well as this year’s charities of choice – Boys and Girls Clubs of Albany, NY​ and Vanderheyden​. 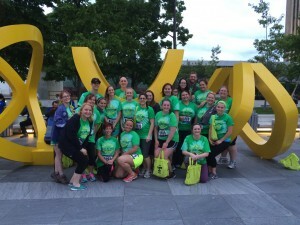 Great job to the UVS CDPHP Workforce Team! 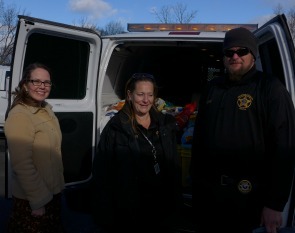 November 22, 2016 – Following UVS’ week-long “Thanksgiving for Shelter Pets” pet supply donation drive, Upstate Veterinary Specialties doctors and staff presented 525 pounds worth of dog and cat food and cat litter to the Warren County SPCA. 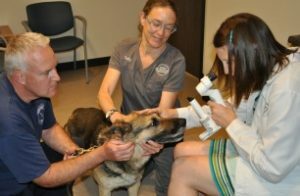 Although the Warren County/Glens Falls Area is a bit of a distance from Upstate Veterinary Specialties in Latham, the staff and doctors of UVS wanted to provide assistance for the newly re-organized group committed to animals and the community. October 5, 2016 — A group of Girl Scouts from the Boght Hills and Latham Ridge Elementary School Troop and their leader took a tour of the UVS hospital. 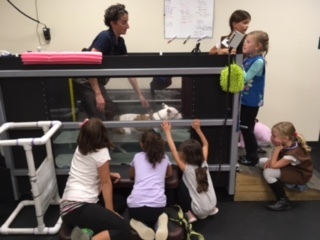 Their visit with Dr. Laura Perez of the UVS Rehabilitation Department included a demonstration of rehabilitation therapies that pets sometimes undergo following surgery or in support of chronic conditions. Dr. Perez’s dog, “Ripley” was a star of the demonstration, as she helped to demonstrate exercises that are often prescribed for patients. The UVS visit and tour helped the scouts earn their Pet Care badges. 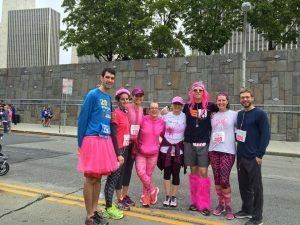 October 1, 2016 – Several Upstate Veterinary Specialties doctors and staff dressed in pink t-shirts (and tutus and wigs!) 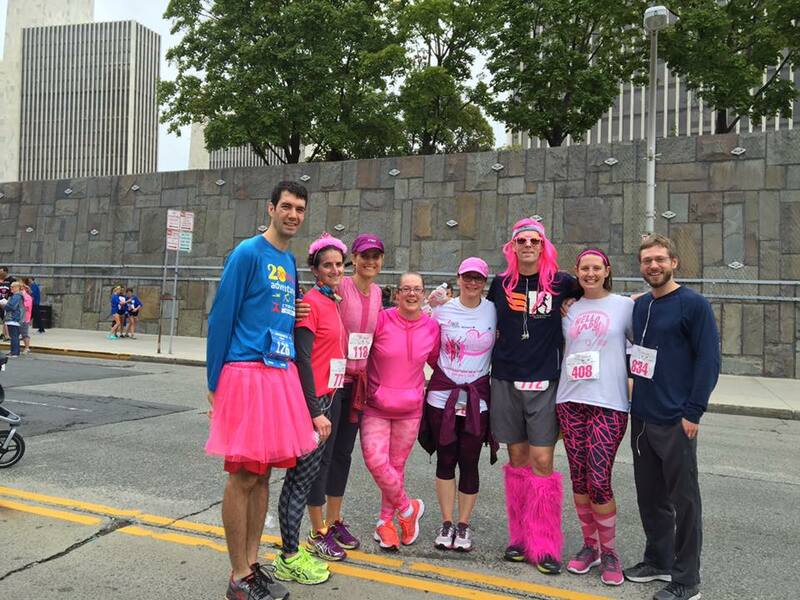 to complete the 5K Susan J. Komen Race for the Cure in Albany in support of the fight against Breast Cancer. July 11, 2016 – Students with the College of St. Rose–Summer Academy for Youth visited Upstate Veterinary Specialties in Latham. 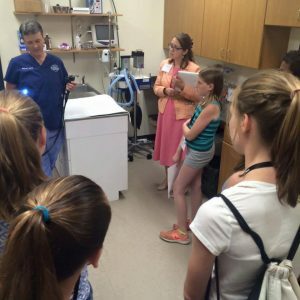 The students began their week-long summer program with a “behind the scenes” tour of the hospital where they met Licensed Veterinary Technicians and Board-certified veterinary specialists. Here they are checking out the Endoscopy Lab! June 7, 2016 – During the 2016 ACVO/StokesRx Screening Event, Dr. Corbett examined 33 service dogs from the following organizations: Empire Servicedogs, Guiding Eyes for the Blind, The Seeing Eye, Colonie Police Department, and Therapy Dog International. May 19, 2016 – Upstate Veterinary Specialties participated in the CDPHP Workforce Team Challenge for the fourth year. This annual, 3.5-mile road race in Albany benefits Hudson Mohawk Road Runners Club, a not-for-profit 501(c)(3), as well as the organizations selected annually as the Charities of Choice. This year’s selected charities are Girls on the Run and Schenectady ARC. 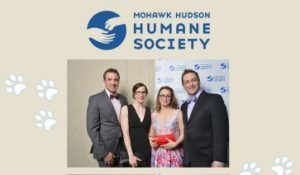 April 29, 2016 – April was a big month for Upstate Veterinary Specialties (UVS) to reach out to the greater Capital District community in support of animal welfare: UVS doctors and administrative staff attended both the Mohawk Hudson Humane Society and Animal Protective Foundation fundraising galas. 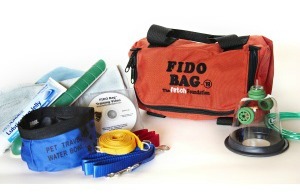 April 14, 2016 – Upstate Veterinary Specialties continues to support the greater Albany community by donating FIDO Bag™ companion animal fire oxygen rescue kits to area fire departments. On April 14, 2016 UVS delivered FIDO Bag™ kits to the Chiefs of the Northside Fire District/F.B. Peck Hose Company and Latham Volunteer Fire Department. 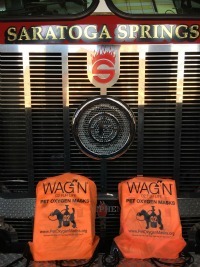 November 24, 2015 – Upstate Veterinary Specialties donated two pet oxygen mask kits to the Saratoga Springs Fire Department earlier this month. UVS is thankful for first responders and hopes to reach out to more fire departments in 2016. 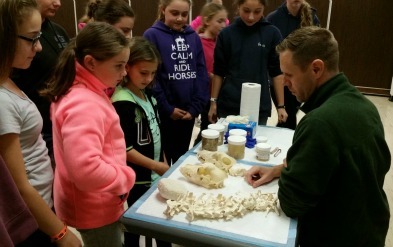 October 28, 2015 – UVS Neurologist Dr. Todd Bishop recently discussed veterinary neurology with a group of middle school and high school aged students at a 4H veterinary science career investigation day at the Cornell Cooperative Extension. Dr. Bishop’s talk included a hands-on component, including animal skulls and tissue samples which the students could touch and manipulate. 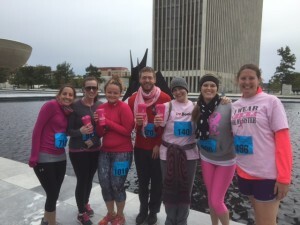 October 3, 2015 – A small group of Upstate Veterinary Specialties doctors and staff joined approximately 2,000 other runners, walkers and supporters for the Susan J. Komen Race for the Cure in Albany. 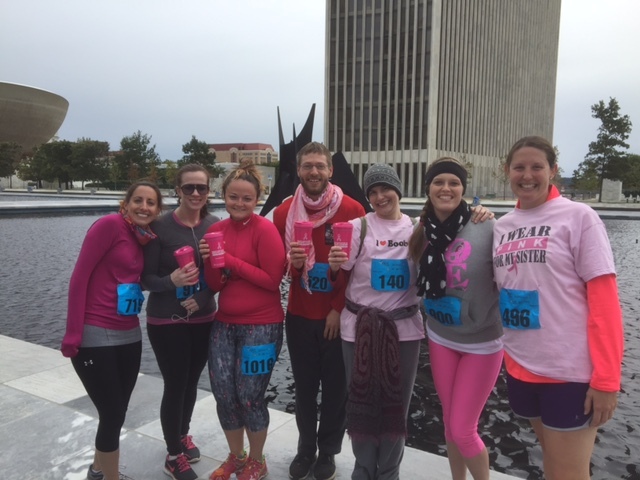 UVS’ers donned pink t-shirts and completed the 5K road race in support of the fight against Breast Cancer. 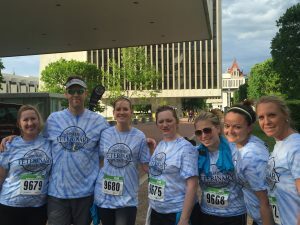 May 21, 2015 – For the third year, members of Upstate Veterinary Specialties participated in the CDPHP Workforce Team Challenge at the Empire State Plaza in Albany NY. The 3.5 mile road race is held each year and is the largest annual road race between Utica and New York City! Proceeds benefit the Hudson Mohawk Road Runners Club, a not-for-profit 501(c)(3) as well as the organizations selected annually as the Charities of Choice, which this year included The Food Pantries For The Capital District, Brave Will Foundation and CEO. March 26, 2015 – Dr. Cassidy Sedacca of Upstate Veterinary Specialties presented to a group of students at the Albany County 4-H Veterinary Science Program. 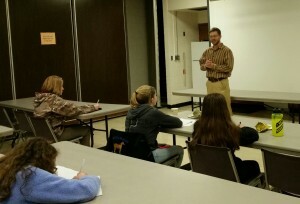 During his presentation, he spoke about his career as a veterinarian and shared insight about veterinary medicine with the group of students considering future careers in the field of veterinary science. February 6, 2015 – Members of the Upstate Veterinary Specialties team participated in National Wear Red Day to help raise awareness about women’s heart health. As part of the “Go Red For Women” event, UVS also made a donation to the American Heart Association to help fund educational programs and research related to women’s cardiovascular health. July 19, 2014 – Team led by Upstate Veterinary Specialties’ Dr. Aaron Wey and Staff donate their time, skill, and muscle to build with Habitat for Humanity Capital District, Fox Hollow neighborhood in Troy, NY. A positive influence to the Community, Habitat for Humanity makes Homeownership real for underprivileged families. Homeownership stabilizes communities and helps make neighborhoods safer. Habitat for Humanity has shown that building homes does more than put a roof over someone’s head. In good housing, families can provide stability for their children. May 18, 2014 – Upstate Veterinary Specialties shows support for their community by participating in the CDPHP® Workforce Team Challenge. This 3.5-mile road race provides health and fitness opportunities in the workplace as well as in the Community. Race proceeds benefit the Hudson Mohawk Road Runners Club, a not-for-profit 501(c)(3) as well as the organization(s) selected annually as the Charities of Choice, including Fast Break Fund and St. Catherine’s Center for Children.